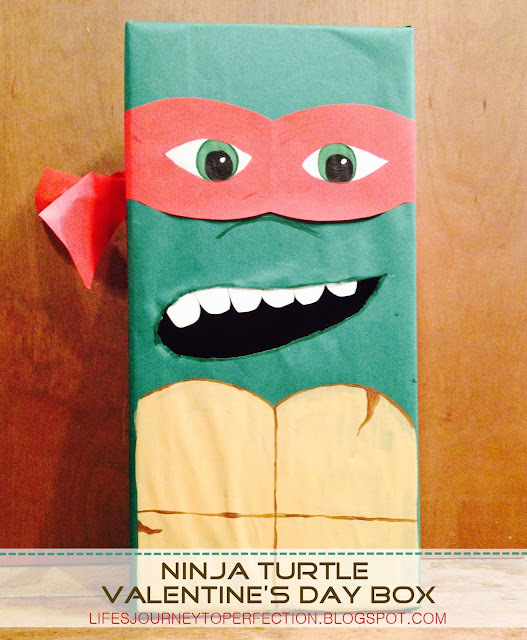 This year I only had to help make one Valentine's Day box, it was for my youngest and it was his first. We decided on the Ninja Turtle, Raphael. Obtain a box, the box I used was one of those big Kashi Granola boxes you get from Sam's Club. I hot glued the top shut. Then using green paper I wrapped the box up just like a present. Next came Raphael's mask. I cut a long strip of red paper wrapped it around the box, put did not secure it yet. I drew on the red paper, the shape of the mask and then cut it out. Now I secured it onto the box with tape. With the remaining long strip of paper, I tied a knot. Yes, I tied a knot with paper! I attached that on the side with some hot glue. With a pencil I drew on the shape of the eyes onto the mask. Then using white craft paint I painted on the eyes. Raphael's eyes have some green, so I mixed some green paint with some white and yellow and painted on the irises. Last came the pupil and it was black craft paint. I out lined the mask with some red craft pain and then mixed some red paint with some brown to make some accent marks, because my son wanted him to look mad. Using some green paint I painted on the curve of the nose. Then I drew on the mouth with a pencil and using an exacto knife or box cutter, I cut out the mouth, using the pencil marks as my guide. I then cut some teeth out of white card stock and hot glued them in between the cardboard and the green paper on the top row of the mouth. Using some green paint I painted around the outside of the mouth. Then came the front part of the turtle shell. I used a yellowish tan paint. Then came back with brown paint for the accents and definition marks. An after thought was making a little door in the back, to get the goodies out of later and for any valentines that might be larger then the mouth opening. It's done and ready for goodies! !